The Penguins organization has it's heels in deep in Scandinavia. They added another Swede along with two new Finns from this draft class. 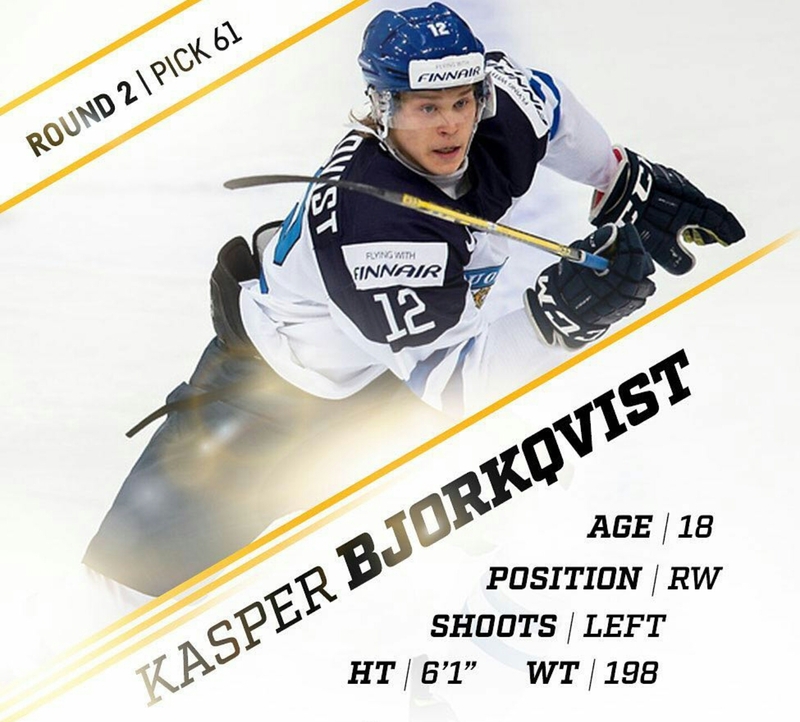 One of those coming out of Finland and the Finnish Junior League is Kasper Bjorkqvist (that is 'Qvist number three on the Penquins roster if you are keeping track at home). Although he won a gold medal with the Finnish World Junior team, Bjorkqvist was not a highly touted player like his Finnish brethren, Patrik Laine and Jesse Puljujarvi. "He did not get much media attention. 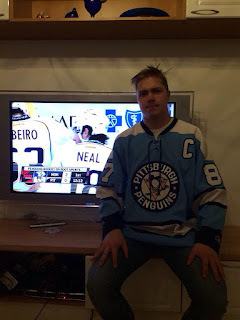 He is not 'big name' in Finnish media," according to Marcus Tissari, who runs the "Pens Finland" Twitter page (@Europenguins). Tissari feels that Bjorkqvist was underrated by the scouts (from a personal standpoint). Bjorkqvist was ranked only as high as 22nd in skating among Europeans in the draft class. However, the Penguins scouts were impressed with the 6'1, 198-pound right winger enough to put a bug in Jim Rutherford's ear. His name was called in the 2nd round, 61st overall. European scout, Patrik Allvin was quoted saying that Bjorkqvist "...can adapt to North American style and is strong down low, strong on the puck." He (Allvin) also stated that he feels Bjorkqvist is a versatile and character player. However, Director of Amateur Scouting Randy Sexton brought things into perspective stating that he feels Bjorkqvist is ..."still about 1-2 years away from turning pro. But he has great hockey sense and a strong skillset." Sexton could not be more right as the young winger has committed to play NCAA hockey at Providence. He will be able to adapt to the smaller American rinks and a faster style of play that will be needed as part of the Penguins new identity. It will also give him some development time to work on areas that need improvement (which are his agility and "hand smoothness"). An interesting note; Kasper will be in familiar company as he and fellow Penguin draftee, Niclas Almari, were teammates for the part of the past three years while in their native Finland. Being with a teammate on the same professional team can not only add comfort when away from home, but it can also add a bit more friendly competitiveness too. Bjorkqvist's scouting report, along with reading up on what the scouts saw in his playing/scoring ability, draws similar comparison to an older 'Qvist on the Penguin's bench (Patric Hornqvist). Although he normally compares his style of play to that of Leo Komarov (all-star center for the Toronto Maple Leafs), the fact that most of his goals come from being down low in the crease as well as his "shoot-first" mentality would lead one to think that he could be a good candidate to replace our beloved Hornqvist in a few seasons should he develop enough. Or possibly be on a line with 'Qvist number two, Oskar Sundqvist. Finns are known for having a great work ethic so the Penguins must have kept that in mind when they took him so high in the draft. Another area worth noting is that Kasper is strong defensively and can really shine on the penalty kill. He is adept at causing turnovers and breaking up passes. A good checking winger, he knows how and when to use and play the body and will not shy away from contact. This is a good thing to have when battling along the boards for loose pucks in order to get a scoring opportunity or when looking for a rebound off the opponents goalie. I would not expect high-scoring numbers from this young man. However, he has the makings of a tough and, yes, versatile bottom-6 forward. It will be interesting to see how he adapts in the NCAA and we will definitely be keeping an eye on him come development camp. In the meantime, you can get a feel for this new addition in the clip below. Welcome to the Penguins, Kasper.